Jussie Smollett has walked free after one of the most eventful and unpredictable news stories of the year so far. The Empire actor was accused of faking an assault against him, after reporting an attack by two men in January 2019. He consistently denied the allegation. Jussie claimed that he had a rope put around his neck and had an unknown substance splashed on his face by two men using pro-Donald Trump slogans. The charges have been dropped but that doesn't mean we know what happened. Here are five big questions you might still have about what really happened in that CCTV blind spot in Chicago earlier this year. We still don't know. Jussie Smollett was not found guilty of faking the attack, but neither was he proven innocent. That fact that prosecutors dropped the charges without sharing the reasons why means that people have no clearer knowledge about what happened. Jussie's fans have been celebrating the result as proof of his innocence, however. But the Mayor of Chicago doesn't believe he is innocent, saying that he was let off the charges because of his celebrity status. What about Obabinjo and Abimbola Osundairo? Obabinjo (Ola) and Abimbola (Abel) are the men who were, at one point, believed to have carried out the attack, as instructed by Jussie. They had appeared as extras on Empire and had trained with Jussie in the gym. Security footage taken on the night of the incident showed them buying items such as a ski mask and a red cap. What has happened with his role on Empire? In February, after the incident, there were reports that Jussie's scenes were cut from upcoming episodes of Empire. Earlier this month Lee Daniels, the show's creator, said that he and the show's cast has experienced "pain and anger and sadness and frustration" due to the allegations. But since the charges were dismissed, both the official Empire Twitter account and the account for the show's writers have voiced their support for the actor. Although many angry fans have reacted negatively to these statements in the comments on both posts. The actor told reporters he was grateful to those who stood by him and that he wouldn't have put his family "through a fire like this" for a lie. "I have been truthful and consistent on every single level since Day One," he said in a short statement. "I would not be my mother's son if I was capable of one drop of what I've been accused of." Did he arrange a deal with prosecutors to go free? 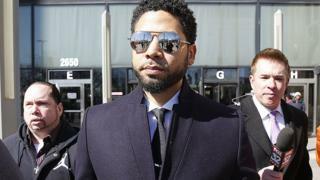 There is also uncertainty over Jussie giving up his $10,000 bail money. He agreed with prosecutors that this would not be returned to him, but insists this was not part of making a deal to secure his release. Chicago police Supt Eddie Johnson describes this as a "brokered deal" between the two parties. Jussie has also carried out voluntary community service in Chicago - which the Cook County State's Attorney Kimberly Foxx described as a "just disposition and appropriate resolution to this case." The actor may have the support of the Empire team, but some believe he has a long way to go before he can fully repair his reputation with some fans. A former public relations manager for Sean Combs, Snoop Dogg and Nick Cannon told Metro that Jussie had been found "guilty in the court of public opinion." "Maybe this guy will appear on some third-rate reality show," said US PR Ronn Torossian. "But I think that Jussie Smollett's career in Hollywood is essentially over."